Werewool attempts to produce new types of fiber by synthesizing proteins that are genetically altered to bond together using an enzyme called transglutaminase. 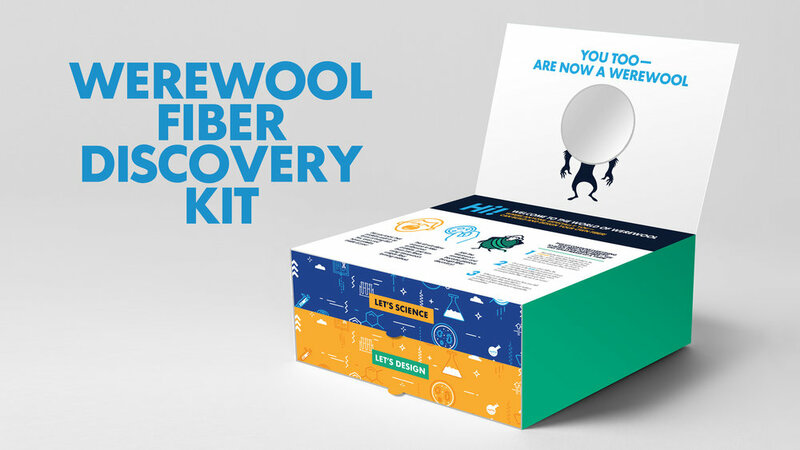 The The Werewool Fiber Discovery Kit as developed to disrupt the traditional material development process and creates an accessible platform where students and designers can collaborate to create new fibers using synthetic biology and biochemistry. The research project will focus on the viability of utilizing cactus hair fibers, specifically from Cephalocereus Senilis, as an alternative for animal-based wool. Scalability will be explored by investigating the effect of Ultraviolet, Infrared, and varying visible spectrum light, as well as temperature, on hair fiber growth. Synthetic biology routes to expression of the gene responsible for hair growth throughout the entire life cycle of the cactus are also being explored to improve the viability of using the cactus hair fibers. Our goal is to develop textiles that will ensure holistic sustainability - taking environmental impacts, efficiency, and the end product's life cycle into consideration. Heating and Cooling Energy Use in Buildings Responsible for: 25% of energy use in commercial buildings and 40% of energy use in residential buildings Buildings consume approximately 40% of energy use in the United States- resulting in a huge carbon footprint. This is a challenge we would like to address through biomimicry and bio-utilization of a naturally insulating and/or temperature sensitive material. We will fabricate a mold of mycelium that mimics the structure of highly insulating polar bear hair that would be filled with hemp foam insulation. Another point of our concept for the tent is to have the ability to put something up and down quickly. This is for emergency settings, natural disasters, and etc. Our current problems are finding which organisms to base our material off of. We have found organisms that are able to insulate and produce heat, but finding a cooling effect has been difficult. Theanne Schiros, PhD, is Assistant Professor at FIT, where she teaches physics, chemistry and sustainability courses. She is the FIT coordinator and faculty lead for the international Biodesign Challenge, guiding students on how to rethink textiles through technology, biology and sustainable design. She is also an Adjunct Research Scientist at Columbia University in the Materials Research Science and Engineering Center (MRSEC), as well as the diversity liaison, working collaboratively across the center to explore 2-D materials for next generation, post-silicon electronic devices, and catalysts for clean energy applications. Schiros is engaged in international sustainable development with organizations such as Engineers without Borders (Haiti) and the Finca Morpho Permaculture collective (Costa Rica). She has published her work in numerous peer-reviewed journals and has been the recipient of multiple grants to support this work, including the National Geographic Chasing Genius Award (Sustainable Planet) for development of a kelp-based bioyarn for textile applications, and was the United Nations ECOWAS Fellow for Sustainable Energy Engineering, the NYSERDA Fellow, and an EFRC Fellow for next generation photovoltaic and electronic devices at Columbia University. Susanne Goetz is an Associate Professor in the Textile/Surface Design Department at FIT. She worked as a textile designer, lecturer, researcher and project manager in Germany, Thailand, and the UK before moving to the USA. Susanne's research and teaching practice focuses on global sustainable design, manufacturing, and business practices. She is a co-founder of the ‘Summer Institute at FIT: Sustainability in Fashion and Textiles’ conference and and leads an annual study abroad program on textile artisanship and sustainability in India. Susanne holds a MSc in Textile and Apparel Technology Management from North Carolina State University and a BA in Textile Design from Hof University of Applied Sciences, Germany. She is a Fulbright Alumna and a fellow of the Higher Education Academy. Evelyn Rynkiewicz, PhD, is an Assistant Professor of Ecology at FIT. She earned her PhD from Indiana University and subsequently conducted research as a postdoctoral research scientist at the University of Edinburgh (National Science Foundation Postdoctoral Research Fellow) and Columbia University. A disease ecologist by training, Evie’s research investigates co-infection in wild mice, how parasites and pathogens interact within with each other and with the host immune system. Evie collaborates with ecologists, bioinformaticians, and immunologists to address integrative questions of how within-host processes affect population and community scale disease dynamics. Her overall goal is to increase science literacy among non-science majors and to give students the confidence to bring in ideas of the scientific process and understanding of the natural world into how they think about their careers. This is her first year as a faculty advisor for the Biodesign Challenge and she has enjoyed every minute! This has been a great opportunity to be a resource for students interested in the intersection of science and design.